Do you ever plan a recipe and go shopping for the ingredients, only to discover that you can’t find that one very important ingredient? Well, for some reason this seems to happen to me all the time. The other day I was planning to make a little dessert and I wanted gingersnaps. I scoured 2 stores and couldn’t find gingersnaps anywhere. Finally I found something that resembled gingersnaps and took them home. I tasted them and they were only just OK – but not with that real gingery kick that my brain was conjuring up. Well, they say that necessity is the mother of invention, and I guess in this case it was true, because I got a brainwave! Hey, why not make my own gingersnaps?? And so I did! 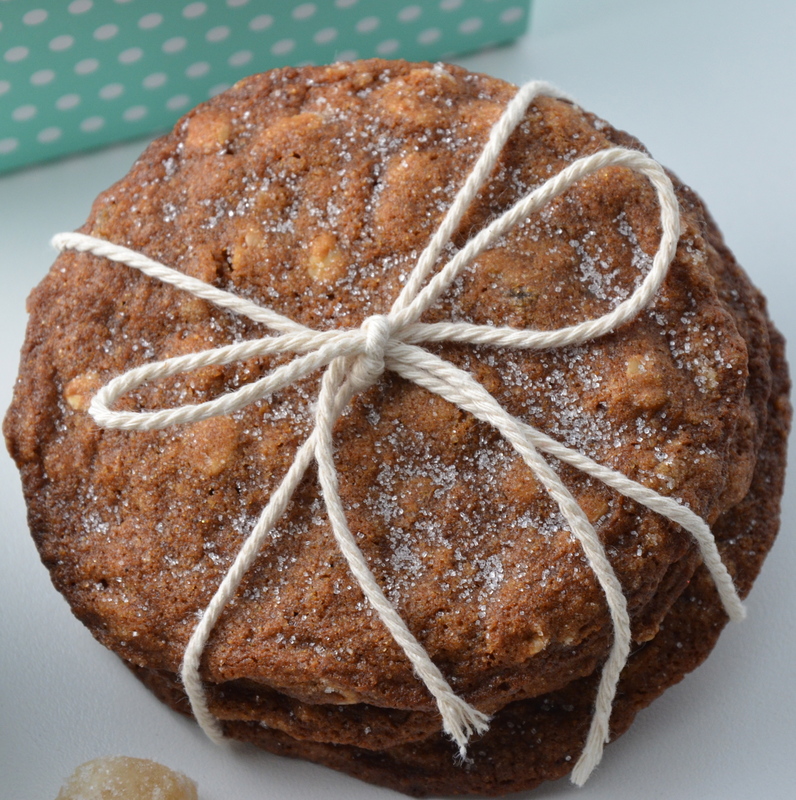 Now these are gingersnaps – bright – spicy – peppery with a bit of earthy sweetness from the molasses. The flavour is ramped right up because there are 3 different kinds of ginger in the recipe – powdered, fresh and candied! These cookies were perfect for my dessert (next post) and in the future I will be more inclined to skip the store-bought stuff, and turn to my own kitchen instead; because as my husband constantly reminds me, “Everything is better when it’s homemade, dear!” This recipe is adapted from “Whitewater Cooks with Friends” by Shelley Adams. I will be bringing a plate of these spicy cookies over to Angie’s Fiesta Friday! My blogging buddies there always appreciate a sweet nibble and these would be great with a cup of coffee or tea after all of the martinis have been polished off! If you haven’t checked out Fiesta Friday yet, pleases join us! This just happens to be the hottest spot on the blogosphere right now – you don’t want to miss it! Mix flour, sugar, baking soda, salt, all gingers, cloves and pepper in a medium mixing bowl. Add melted butter, molasses and egg and beat well. Take 1 tablespoon of cookie dough and roll into small ball. Place only 6 balls on a cookie sheet at a time because they really SPREAD! Flatten each ball into ¼ inch thick with the bottom of a glass that has been dipped into sugar. Bake for 15 minutes or until crisp. Keep your eye on them! Allow to cool 15 minutes before removing from the sheet. Store at room temperature. Please note: The original recipe called for shortening, but I prefer to use butter. It stated that the cookies would keep their shape if you use shortening. If you use butter, they really spread and you will only be able to bake 6 cookies per sheet. Lovely photos, they look delicious – I love everything with ginger, so I’ll have to try these! 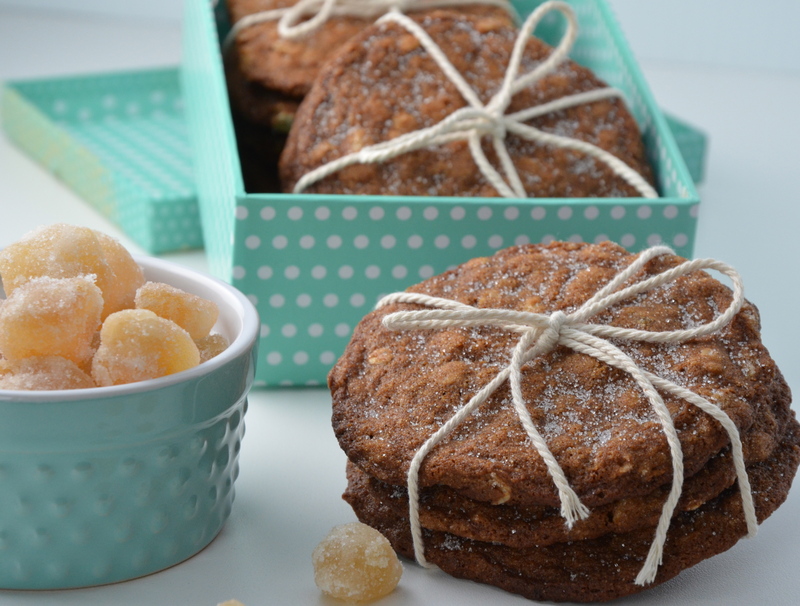 Well, if you are a fan of ginger, you will really love these – they are really gingery! My Dad absolutely adores ginger, I think I’ll have to try these out for him! Your photos are beautiful too! Awesome! Let me know what he thinks of them! These look absolutely wonderful! I am addicted to Trader Joe’s Triple Ginger cookies – I’m certain your homemade ones are 100x better and with the real ginger kick I love! Thank you so much for sharing, I will definitely make these. There’s nothing like a really spicy ginger cookie. Using three forms of ginger is a great idea. I have also squeezed fresh ginger through a garlic press which gives you nice clear ginger juice. Mmmm, Hilda! You always have the very best ideas! I will try this! Absolutely – I would never leave you out, Lisa! Oh Sylvia, you are too sweet – thanks for such nice comments! 😀 I’m really glad you like it! Well, I am a very determined person and I really wanted them for my dessert 😀 Glad you like the pics! Those cookies look so yummy! 🙂 I bet they’re great with both the fresh and candied ginger! Julianna….so glad you made your own! These are so much more delicious that you could have bought at the store….I don’t doubt that for a second! And I love how you wrapped them in string! Gorgeous! And that polka dot box…love it! I just love my dollar store finds! They have the best things for photographs! 😀 So glad you like it! OH, I know the FF gang 😀 Glad you like them, Jhuls! Thanks Geraldine! This is a great recipe! Gorgeous, Julianna. These look perfectly crispy and spicy with three types of ginger! I love me a good gingersnap! Mmmm me too! At night with a good big mug of tea! 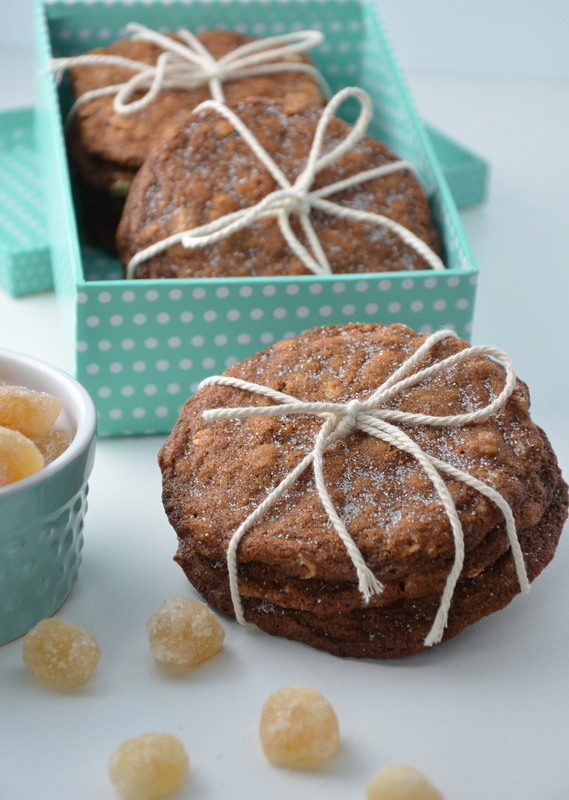 I’ve been wanting to make ginger biscuits for a while…I’m bookmarking your recipe now! Thank you! Good, Dimple! Let me know what you think! Love gingersnaps and have been wanting to make these. Yours look perfect. What could I use in place of Molasses? I think I would try a good dark brown sugar – that should be good! You won’t get quite the same flavour, but it would be close. I love ginger snaps:) thanks for the recipe! Looking good, Julianna! I regularly have that problem too – you get a recipe in your head and then you don’t have the ingredient. Its a special kind of torture! For some reason, Molasses has always been a difficult ingredient to find until recently. I’m definitely going to try this soon! Thanks for bringing it to Fiesta Friday! Just keeping you on your toes! 😀 Glad you like it! Hi! dear friend! wonderful photos and delicious recipe! my husband love gingersnaps… will give it a try! looks yummy! Oh, me too! So very frustrating, isn’t it? I love baking with fresh ginger– it adds such fabulous flavor. These look delicious! Some gorgeous looking gingersnaps, chef. I love ginger and extra spicy…yes please :). Beautiful color of the cookies. Hi Judi! Yes, it seems that many of us love ginger!! Thanks goodness, because that is what I brought to the party! The cookies look delicious… and I must say I love the photo composition of your tied cookies in a box – looks fab! Julianna, these look amazing! Your pictures are gorgeous! I know what you mean about having everything except one ingredient. That happens to me all the time and it is frustrating! Thanks for sharing the recipe ! This is one awesome brainwave you had there, Julianna! Fabulous cookies! My mom would love them as she loves her ginger! Your husband is right! Lovely recipe (I love ginger flavour) and great photos, I love the presentation, they look vey elegant! LOL! I will tell him he is right! He will be so happy to know that! 😀 And thanks so much for your kind comments! Have a lovely week! Oh, I know exactly what you are talking about! 😀 All in good time, though! I love spicy biscuits!!! I could eat a lot of these lovely Gingersnaps! Me too, Serena. I won’t tell you how quickly it took for the whole batch to disappear!